Today's IT groups must respond swiftly to diverse, rapidly changing business demands while maintaining operational performance and application availability. At the same time, they're under pressure to control operating costs as they manage an increasingly complex environment. A software-defined data center environment helps IT groups meet these challenges. It provides greater infrastructure ...agility to meet fast-changing business needs, while reducing management complexity and helping IT hold down operational costs. 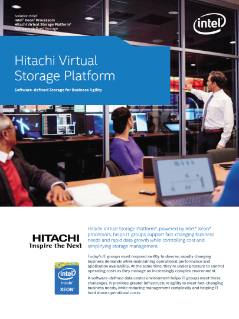 Now, with Hitachi Virtual Storage Platform* (Hitachi VSP), the benefits of software-defined storage, including enterprise-class storage virtualization, are available to any organization. Hitachi VSP comprises a family of compatible software-defined storage solutions, from mid-range to scalable enterprise systems. Powered by Intel® Xeon® processors, all systems run the same software based on Hitachi Storage Virtualization Operating System* (Hitachi SVOS), so they all provide the same management, virtualization, migration, and data protection features. This means businesses can choose the right entry point based on size and price, and expand as their needs grow.